Barton Kyle Yount was born at Troy, Ohio, January 18, 1884. He was a student at Ohio State University, 1902-03, and graduated from the United States Military Academy, 1907. He married Mildred Almy Parker, September 29, 1914. Yount was commissioned a Second Lieutenant in June 1907, and advanced through the grades to Brigadier General in 1936. He served as Assistant Chief of the Army Air Corps, Washington, DC. He was promoted to Major General, October 1, 1940, Lieutenant General, 1943. General Yount commanded the Southeast Air District, Tampa, Florida, November 1940-July 1941. He then commanded West Coast Air Corps Training Center, Moffett Field, California, July 1941-January 1942. 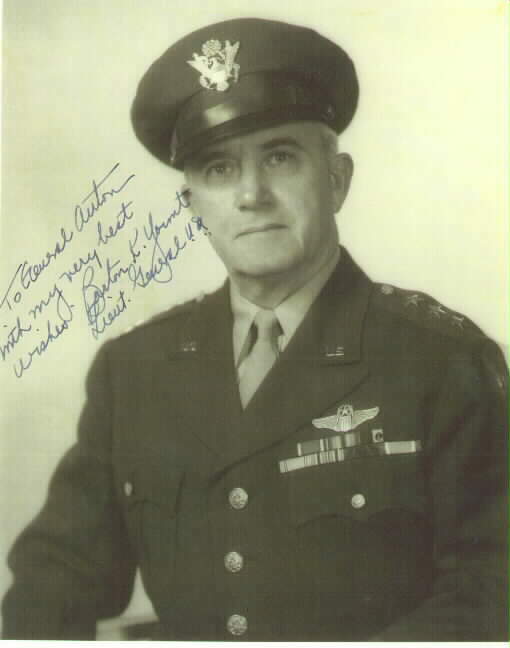 The General served as Commanding General, Army Air Forces Flying Training Command, Fort Worth, Texas, March 1942-July 1943, and then as Commanding General, Army Air Forces Training Command, July 1943. The General retired with the rank of Lieutenant General, June 30, 1946, and then worked as President of the American Institute for Foreign Trade, Phoenix, Arizona, since July 1, 1946. During his military career General Yount received the following medals and decorations: Distinguished Service Medal with Oak Leaf Cluster, Legion of Merit, Air Medal, Knight Commander of the Order of the British Empire, Officer of Legion of Honor (France), Officer, Order of Crown of Italy, Grand Officer of Orange-Nassau (swords), Netherlands, Grand Officer, National Order of Southern Cross (Brazil), Order of Merit, 1st Class (Mexico), Cloud Banner Decoration (China). General Yount lived in Arizona until his death there on July 11, 1949. He was buried with full military honors in Section 30 (Grave 1047-RH) of Arlington National Cemetery. His wife, Mildred Almy Parker Yount (1891-1986) is buried with him. 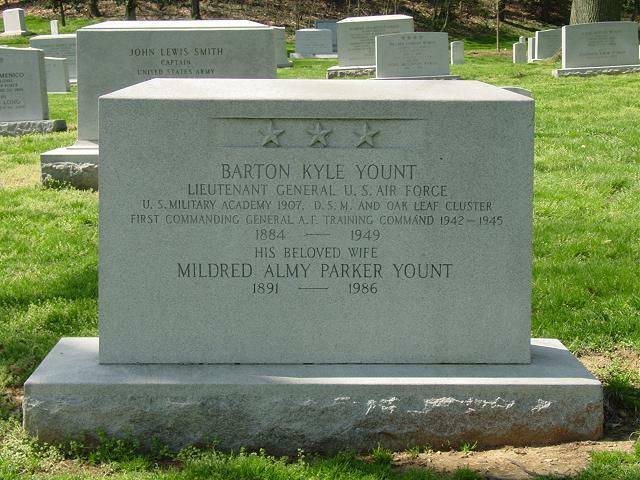 WASHINGTON, July 18, 1949 – Lieutenant General Barton K. Yount, wartime head of the Army Air Forces Training Command, was buried today in Arlington National Cemetery with military honors. 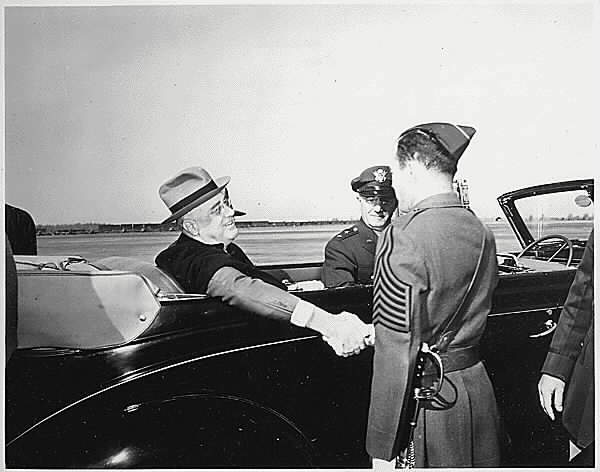 General Young, who died a week ago in Arizona, retired in 1946 after thirty-five years of service in the Air Force, to become president of the American Institute of Foreign Trade at Phoenix. A funeral service was held in the chapel at Fort Myer in the presence of Army and Air Force officials and the General’s widow and a son, Captain Barton K. Yount, Jr.